December in the USA is a month filled with celebrations of family and culture. Schools typically have a winter break around the Christmas holidays, and many Americans take time off of work to travel and spend time with friends and family. Temperatures continue to drop, and many places across the country see increased snowfall. Here are the festivals and events that happen each December in the USA. First Week of December: Christmas Tree Lighting. 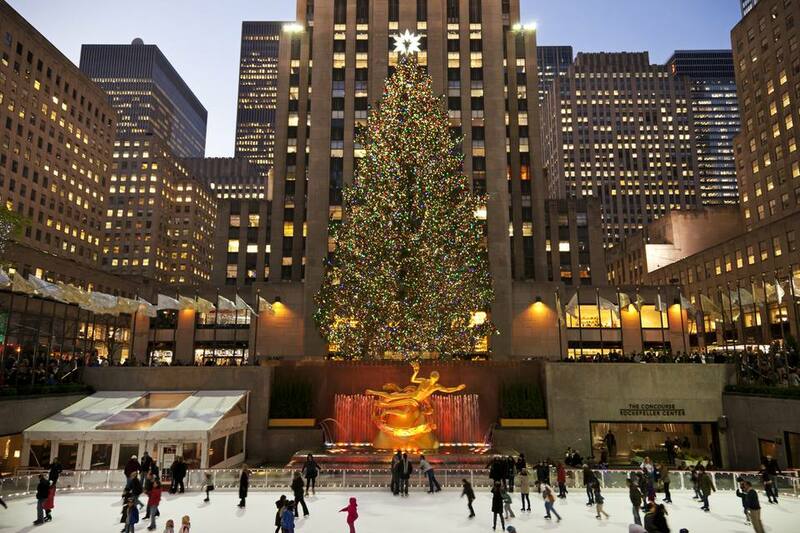 In larger cities, particularly Washington, DC, and New York City, the first week of December is the traditional time to usher in the Christmas holidays with the lighting of the Christmas tree and pageants featuring holiday music and performances. Many celebrations also use this time to light or present the Hanukkah menorah. First Week of December: Art Basel Miami Beach. This contemporary art show and sale, which draws hundreds of American and international artists, has become one of Miami's biggest and most anticipated annual events. In addition to the art exhibitions, Art Basel is also renowned for its glamorous parties. Learn more about the Art Basel Miami Beach on the website. December 7: National Pearl Harbor Remembrance Day. On December 7, Americans commemorate a date the former President Franklin Roosevelt is famously quoted as saying "will live in infamy." On this day in 1941, Japan attacked Pearl Harbor naval base in Hawaii, killing 2,400 people and sinking four battleships. December 7, 2016, will mark the 75th anniversary of the attack on Pearl Harbor. The most poignant place to be on that date will be at the Pearl Harbor Visitors Center and the USS Arizona Memorial. The Center will commemorate the day with live music, film screenings and ceremonies during the days leading up to and after the seventh. Early to Mid-December: Hanukkah. The eight-day Jewish holiday, also called the Festival of Lights, takes place in early- to mid-December. Its date is determined by the Hebrew Calendar, falling on the 25th day of the month of Kislev. Hanukkah celebrates the re-dedication of the Holy Temple in Jerusalem with the lighting of the Menorah, a nine-branched candelabra. Hanukkah is commemorated in a number of U.S. cities, particularly in metropolitan areas on the East and West Coasts and in Chicago, all of which have thriving Jewish communities. December 24: Christmas Eve. If Christmas day falls on a Saturday or Sunday, then it is common for workers to receive Christmas Eve off. Christmas Eve is the last shopping day before Christmas, so almost all stores in the U.S. will be open to accommodate last-minute shoppers on this day. The Post Office and other services will also typically be open to serve customers on Christmas Eve. December 25: Christmas Day. Although the United States is a secular nation, Christmas is the largest and most widely celebrated religious holiday. December is filled with Christmas-related celebrations, from tree-lightings to light displays to Christmas markets. December 25 is a national holiday, meaning all businesses, stores, and government offices will be closed. In fact, Christmas is the one day of the year when you can be assured that the entire country actually takes a rest. For example, the Smithsonian Museums in Washington, DC, close on one day of the year, and that is Christmas Day. For more information on Christmas events taking place near where you are, have a look at this special section on Hometown Holidays. December 31: New Year's Eve. Like Christmas Eve, New Year's Eve may or may not be a day off. It all depends on the day of the week that New Year's Day – a national holiday – falls. But no matter the date of New Year's Eve, it is hugely anticipated, particularly because of the rousing parties that are thrown in order to ring in the new year. The largest New Year's Eve party in the United States is thrown in Times Square in New York City. Las Vegas is another popular spot for New Year's Eve. But every city has dozens of ways to celebrate the new year.